After much thought, its going to be 3 books. The cover is being redesigned to accommodate the series. Love to hear from you on what you would like and what you don’t like! Book 1- Website Strategy. Perfecting your messaging strategy and website presence. Book-2. Digital Media. How to create your digital network to communicate directly with your market. Book-3. Technology. 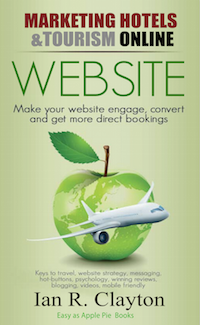 Winning back your brand from the OTAS or how to “Stop OTAs from eating your Apples”. Graphic artist are having fun with these option. Hi, I am Ian R Clayton, Author of How to Build Your Business Online, publisher of TravelersInsights magazine and CEO of AXSES. 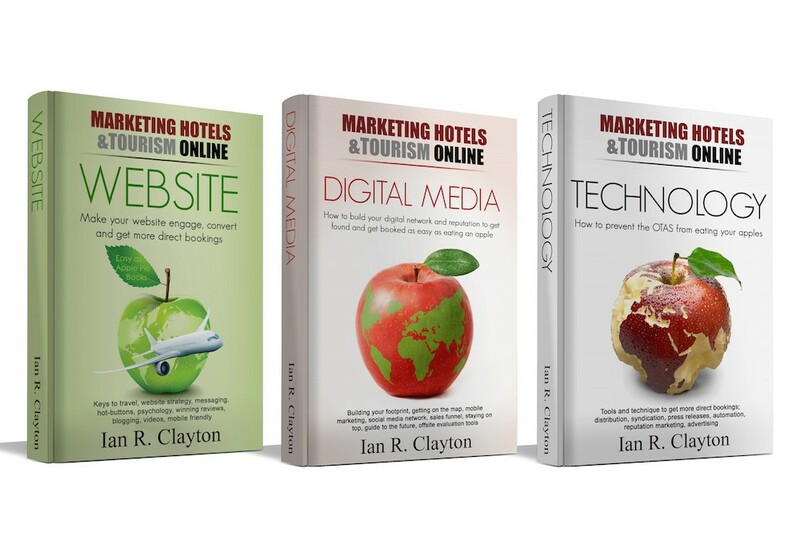 “Marketing Hotels & Tourism Online” is my latest book in the online marketing series. It is my real business passion. The first book in the SERIES is WEBSITE. It is all about your website: What you need to have, how to optimize it for google, how to optimize it for bookings, how to create hot-buttons that get attention and get action. This book also covers an essential review strategies to help you build and market reviews on your own website. It covers video production and the physiology of sales. This book series is a very much updated and specialized edition of my first business book, with more content and with examples and cases from real life tourism marketing for hotels, tourism operators and destinations. Tourism is a subject I know a good deal about having been trained in hospitality and worked as a kitchen aid, head chef, barman, waiter and general manager in the catering and hotel business. That was followed up by studies in Business, Computer Science and Marketing leading to my second career in tourism development and marketing as CEO of AXSES. “Marketing Hotels & Tourism Online” is packed with advice and personal experience. I have learned and succeeded in building top marketing platforms and services by hard knocks and I delight in sharing my mistakes, my insights and knowledge with you. Over the years our team at AXSES has created many firsts and won several nominations and awards. Our best rewards are always helping clients succeed in getting more business and building sustainable brands. How to Market Your Hotel and Tourism Business is covered in depth, but at a level that builds and does not overwhelm. You will understand what this new online media is all about and you will have no doubt about how it can help you. As Mike Keonigs, creator of TrafiicGeyser, InstantCustomer, MainStreetMarketing, AuthorExpertMarketing and other great technologies, now used by thousands of business people, says … “In these pages you’ll find hope – hope that your tourism business can thrive even now in an environment of abundant change, hope that you can get back to what attracted you to hospitality in the first place rather than spending too much time putting out fires and trying to get new customers. Most importantly it provides a process for helping you connect with the right people who really will appreciate what it is you offer. The book is now with the editors and there are few steps before its on the shelf. It will be published very soon. Is Facebook Organic Marketing Dead? : Social Media Examiner - MARKHAT.COM on What Is Digital Media And Why Does It Matter?